It’s official: the Internet community has officially gone off the deep end over Pinterest. We tweet our pins. We Facebook our pins. We write articles about how Pinterest is the Next Big Thing and how it Sends So Much Traffic and how it’s basically the Greatest Thing Since Twitter. And yes, America, Pinterest may be the Greatest Thing Since Twitter (I’ll let you duke that out in the comments section). Yet as the site becomes increasingly saturated, I’m increasingly disappointed at all the users who get it wrong. Pinterest has a flavor and a style all on its own – and like any social media site, there are unofficial “rules” that savvy Pinterest users abide by. I know it seems strange to think of guidelines on a site where cat pictures, fashion magazines, cookbooks, and craft seminars meld into one big ADHD melting pot, but Pinterest is already showing signs of sagging under mass user influx. I’m sorry, folks, but you can’t post random images off your blog and expect them to gain traction. You can’t just post pictures of your products and wait for the referral traffic to come pouring in. And for heaven’s sake, Pinterest is not a Facebook photo album. You can’t just pin random pictures from your life and expect Pinterest users to care. You should, however, use Pinterest as it was intended: a visual idea board, a form of visual storytelling, a way to inspire others and to be inspired. Brands that remember this gain Pinterest followers and repins by the thousands. The brands who forget it fail. The trick is to recognize which types of content will do well on the site — and then use those types to propel your brand. Pinterest has a strong “help-me-help-you” vibe. Help your followers help themselves by creating tutorials. Image-based tutorials (such as the one above) often get more repins, but images that link to a tutorial (an image that says “How to Turn a T-shirt into a Tank Top,” for example) often bring more site traffic. Little tips and tricks (“Catch gnats with apple cider vinegar!” or “Use a dryer sheet to repel mosquitos!”) spread like wildfire on Pinterest. As one of the few tech brands to immediately hop on the Pinterest train, Mashable has amassed an impressive following on Pinterest thanks in part to their Tips & Tricks pinboard (and pins like this one). Find a quote that sum up your company mottos or beliefs? Got any brand-appropriate quotes that make you laugh? Pin them – few things spread faster on Pinterest than quotes. Pinterest users adore an implied promise of results within a certain timeline. A cleaner house in seven days? A safer browser in fifteen minutes? These pins sound too good for users to pass up. Heck, even I couldn’t resist clicking on this pin (and I’ll have you know my hands are now incredibly soft). Collections of useful information inspire pinners to save these resources for future use – a sort of visual bookmark, if you will. Offering a link that promises quality content with a huge collection of information is a terrific way to attract tons of site traffic. Infographics are huge on Pinterest, but not the statistics-packed, long-as-your-arm infographics you’re used to. Shorter, photo-heavy infographics like this one tend to attract more attention. This mega-list of Dr. Oz-recommended diet products (posted by none other than Dr. Oz himself) is a fantastic example of brand-targeted, Pinterest-friendly content. Users aren’t going to analyze each food product on the list, but the sheer length makes them feel compelled to share it with their friends. It’s also a good example of a “visual bookmark” pin (similar to #5), since it’s a list each pinner can refer back to later. The entire concept of Pinterest revolves around images. Users decide which link to click, which product to buy, which pins to share purely on images. So it’s no surprise, then, that some of the most popular content on Pinterest are photos – but not just any photos, mind you. Users are captivated by the “must-share photo:” those images that cause a knee-jerk reaction within us, make us smile, make us laugh, make us sigh. These pics have the must-share factor, and they spread like wildfire on Pinterest. If it doesn’t inspire you, don’t pin it. If it doesn’t cause a reaction in you, don’t pin it. If it won’t be earnestly helpful to others, don’t pin it. Seek to inspire your followers. You’ll never disappoint. 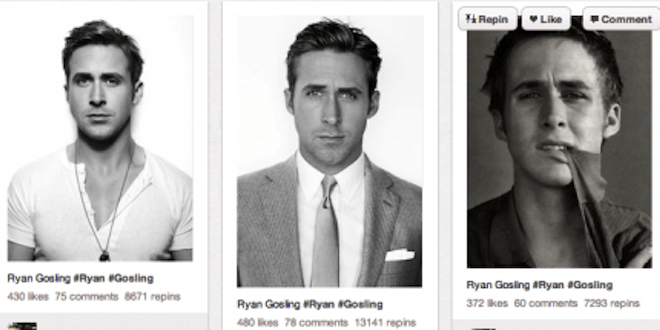 And if all else fails…just pin something with Ryan Gosling in it. Seriously. That dude’s like crack to Pinterest users.